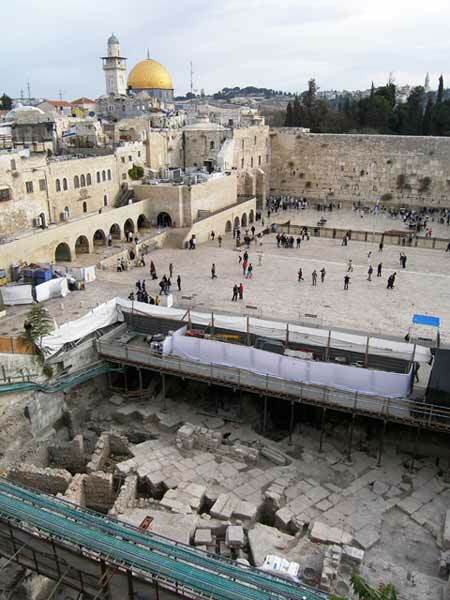 Large-scale archaeological excavations were conducted from 2005 to 2009 in the northwestern part of the Western Wall plaza in Jerusalem (Permit Nos. A-4604, A-4710, A-5002, A-5432, A-5568; map ref. NIG 22219–20/63155–58; OIG 17219–20/13155–58; Figs. 1, 2). The excavations, undertaken on behalf of the Israel Antiquities Authority and initiated and underwritten by the Western Wall Heritage Foundation, were directed by S. Weksler-Bdolah and A. Onn, with the assistance of B. Ouahnouna, S. Kisilevitz, L. Shilov, P. Betzer and I. Zilberbod (area supervision), Y. Ohayon, R. Abu Ta’a, A. Gavri’eli and E. Bahar (administration), B. Ajami (safety inspection), V. Essman, M. Kipnis, M. Kunin, T. Kornfeld and V. Pirsky (surveying), T. Sagiv, A. Peretz and S. Weksler-Bdolah (field photography), D. Gahali and P. Partush of Skyview Company (baloon photography), N. Zak and I. Berin (drafting, final plans), C. Amit and M. Sulzberger (studio photography), R. Vinitsky, Y. Kupershmidt and G. Beiner (metallurgical laboratory), O. Raviv and R. Vinitsky (stone and bone laboratory), Y. Bukengolts and A. Ganor (pottery restoration), D. Wineblatt (pottery, stone and glass drawing). Additional scholars who participate in the processing of finds and publication include Z. Greenhut (Iron Age pottery), R. Rosenthal-Heginbottom (Roman and Byzantine pottery), M. Avissar (Islamic and Ottoman pottery), Y. Gorin-Rosen, T. Winter, N. Katsnelson and B. Ouahnouna (glass vessels), G. Bijovsky and D.T. Ariel (numismatics Roman period), R. Kool (numismatics later periods), L. Di Segni (bread seals), B. Sass (epigraphy), T. Ornan (glyptography), D. Weinstoub (grafitto on pottery vessels), B. Brandl and S. Kisilevitz (bone objects), R. Kletter (Iron Age figurines), K. Cytryn (frescoes), L. Horowitz (archaeozoology), Y. Goren (micromorphologic analyses), Y. Nagar (physical anthropology), G. Stiebel and A. Lester (metallic artifacts), D. Gil (geology) and O. Peleg (architectural elements from the Roman period). The excavations were conducted with the aid of c. 60 laborers from the IAA and a manpower company. Preliminary conservation of the architectural remains was carried out by the IAA Conservation Department, headed by G. Ivanovski and A. van Zaiden, who also studied construction methods. Thanks are extended to the Western Wall Heritage Foundation and its director M. (Solly) Eliav, as well as to H. Kanari, R. Kutchmark, O. Cohen, Shoham Galnor Engineering Co., Ltd and Mr. Y. Sandetch, Ashmar Co., Ltd, E. Stekel and R. Marziyano for all the technical assistance rendered throughout the excavation. 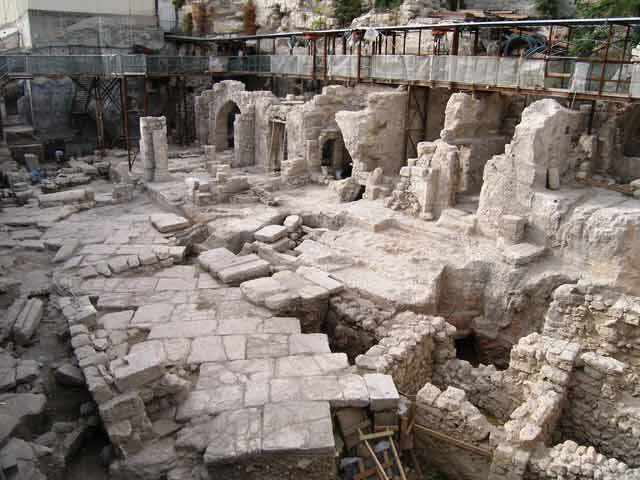 The excavation area (c. 1.5 dunams) is located c. 100 m west of the Temple Mount to the foot of a high bedrock cliff, separating today the Jewish Quarter from the Western Wall plaza. The excavation was carried out in an area, slated for the construction of a visitor’s center. The exposed remains will be preserved as the ground floor of the planned building. The first season of excavations took place in September 2005 and the excavations were renewed in April 2006 and continued uninterrupted until February 2009. Concurrent with the inception of fieldwork, stabilization and support work to the buildings adjacent to the excavation area were carried out, as well as preliminary conservation measures of the exposed ancient remains. The area of the excavation is located along el-Wad (Ha-Gāy) Street, which existed in this region until 1967. This street, leading from Damascus Gate in the north to the Dung Gate in the south of the city, preserves the line of the eastern colonnaded street (cardo) of Jerusalem and serves to this day as one of the principal arteries in the Old City of Jerusalem. The entire width of the ancient street, including the sidewalks and the row of shops alongside it, was exposed at a depth of c. 4.5 m below the current plaza level. The excavation enabled us to follow the development of the street from its paving in the second century CE until 1967. During this period of time the level of the street rose c. 4 m and its width was reduced from 11 m to just 3 m.
A short preliminary summary of the principal excavated finds is presented below. The description begins with natural bedrock, going up, that is from the earliest level to the latest. The excavation area extended over the northeastern slopes of the western hill, which is the Upper City of the Second Temple period. The surface of natural bedrock in the region of the excavations drops precipitously from the level of the western hill (today the Jewish Quarter area) to the northeast, toward the confluence of the Transversal and the Tyropoeon Vallies. The natural topography was intensified by the quarrying activity that first occurred at the end of the First Temple and continued in the Second Temple periods. This activity created a rocky stepped cliff with an overall height of c. 18 m; it descends from an elevation of c. 740 m above sea level at the top of the bedrock cliff in the southwestern part of the excavation area down to 722 m in the quarries of the area’s northeastern part. Natural bedrock surface in the excavation area was reshaped in the Roman period when the eastern colonnaded street was built at the foot of the bedrock cliff, which was hewn as a vertical rock wall (max. height c. 10 m), aligned north–south; today, it separates the houses of the Jewish Quarter from the Western Wall plaza. The remains of quarries, exposed across the width of the natural bedrock slope, were ascribed to the initial phase of human activity in the investigated area. The line of quarries produced a prominent bedrock terrace that extended along a zigzag line from the northwestern part of the excavation area to the southeast (Fig. 3). The remains included vertical bedrock walls (height 3–4 m), hewn stepped surface and severance channels. Diagonal rock-cutting marks, cut with single-point chisels, could be discerned on the bedrock walls. The quarries in the northwestern part were sealed with earthen fills that contained numerous potsherds, dating to the eighth–sixth centuries BCE. Walls of buildings from the seventh century BCE adjoined the rock-hewn bedrock walls and therefore, the remains of quarries could not be dated later than the seventh century BCE. The remains of buildings, including an alley (Fig. 3:1–9), were exposed on the lower bedrock terrace in the northern part of the excavation area. The main building (Figs. 3:1–6; 4) was probably a four-room house, although its complete plan may have included other rooms that were neither preserved nor exposed (Weksler-Bdolah S., Greenhut Z., Onn A., Kisilevitz S., Ouahnouna B. 2008. An Impressive Building from the End of the First Temple Period in the Western Wall Plaza. In D. Amit and G.D. Stiebel [eds.]. 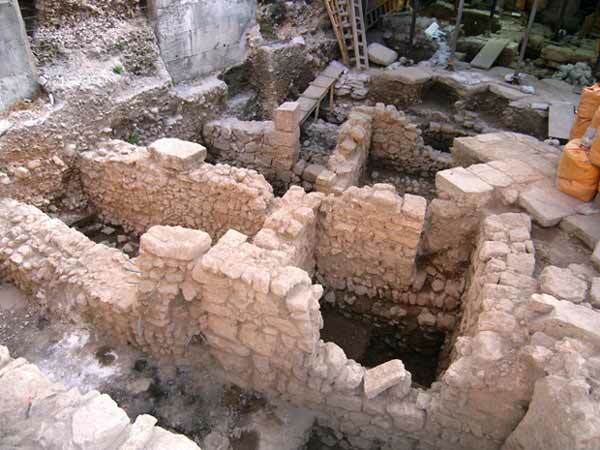 New Studies in the Archaeology of Jerusalem and Its Region, Collected Papers,Vol. 2. Pp. 35–43 [Hebrew]). Wall sections (Fig. 3:8, 9) to its west probably belonged to another building. Three long rooms of the main building and a perpendicular broad room, which was divided into three small spaces, were exposed. The building remains were impressive. The walls, founded on natural bedrock, were preserved c. 5 m high (Fig. 5). Tamped-earth floors mixed with crushed chalk were revealed in the rooms. The latest potsherds in the floor beddings and the soil fills beneath them enabled us to date the building’s construction to the seventh century BCE. Evidence of repairs and slight modifications to the building, without altering its basic plan, had occurred during the course of its existence and were discovered in the walls of the western room (Fig. 3:4), as well as west and south of the building itself. A large stone collapse on the floor of Room 2 bears witness to the rapid devastation of the building, which could be attributed to the destruction of the First Temple. Nevertheless, the absence of complete vessels below the destruction layer indicates that the building was abandoned prior to its destruction. Following the destruction, the building was filled up with accumulated soil to the top of its walls’ height. This soil fill contained a plethora of finds from the end of the First Temple period and most likely originated from the erosion of the Western Hill’s upper slopes. The flagstones of the Roman cardo, which were placed directly on the tops of the walls from the First Temple period, sealed the building and protected it until the present. Noteworthy among the finds from the building were five personal seals that bear Hebrew names (Ornan T., Weksler-Bdolah S., Greenhut Z., Sass B. and Goren Y. 2008. Four Hebrew Seals, One Depicting an Assyrian-like Archer, from the Western Wall Plaza Excavations, Jerusalem. ‘Atiqot 60:115–129). 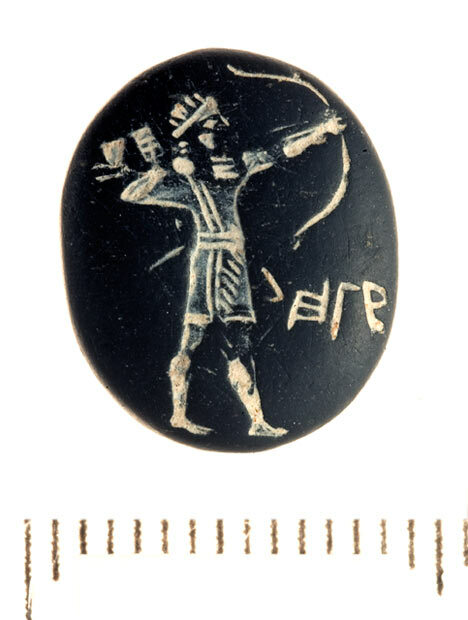 The image of an archer with a bow in an Assyrian style is engraved on one of the seals and the Hebrew name לחגב (lhgb) appears next to him (Fig. 6). Another seal bears the inscription 'לנתניה בן יאש' (lntnyhw bn y’š) and yet another – 'לידעיהו אושא' (lyd’yhw ‘wš’). Other artifacts included a seal or amulet decorated with a winged uraeus, an Egyptian scarab, several ancient Hebrew script graffiti, c. 17 jar handles with lmlk stamped impressions and concentric circles, c. 450 fragments of female and animal figurines and numerous fragments of local pottery vessels. It should be mentioned that no jar handles with rosette impressions were found. Meager remains, mostly rock-hewn installations and no building remains were ascribed to this phase. On the upper part of the high bedrock cliff, remains of a rock-hewn aqueduct that descended gently from south to north (L116; exposed length c. 11 m, elevation 737.90 m above sea level; Fig. 3), were discovered. This is a section of the Lower aqueduct to Jerusalem, parts of which had been discovered in the past (Mazar A. 2002. A Survey of the Aqueducts to Jerusalem. In: D. Amit, J. Patrich and Y. Hirschfeld [eds. 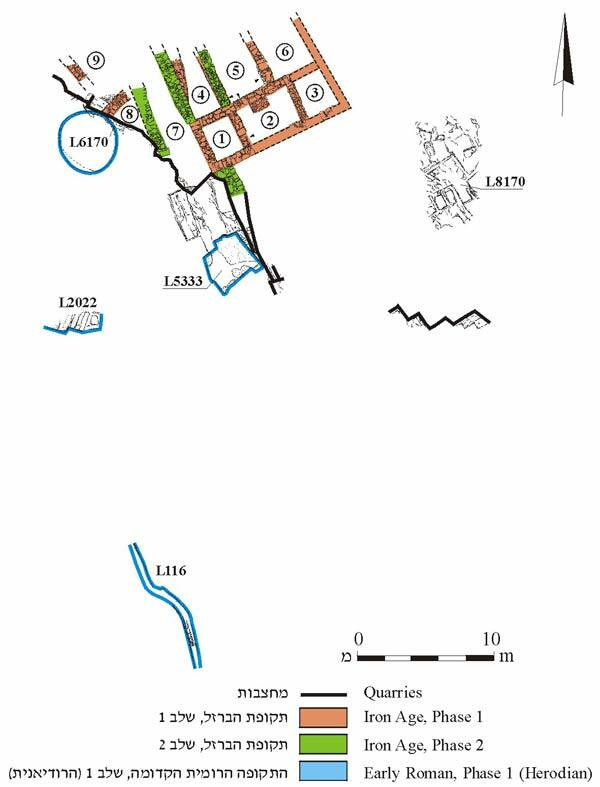 ], The Aqueducts of Israel, Journal of Roman Archaeology, Supplementary Series, 46, Portsmouth RI: 210-244; HA-ESI 117; HA-ESI 118). The western side of the aqueduct survived to c. 1.4 m high, whereas the eastern side was removed at a later time. A ceramic pipe was inserted inside the aqueduct during the Ottoman period, similar to other sections of the aqueduct that had been exposed. The Lower aqueduct from the time of the Second Temple conveyed water from the Solomon’s Pools to the Temple Mount. This segment of the aqueduct is the northernmost section currently known. It is customary to ascribe its beginnings to the time of the Second Temple, probably the Hasmonean or Herodian period. It seems that the current bedrock cliff had not yet been hewn at the time. 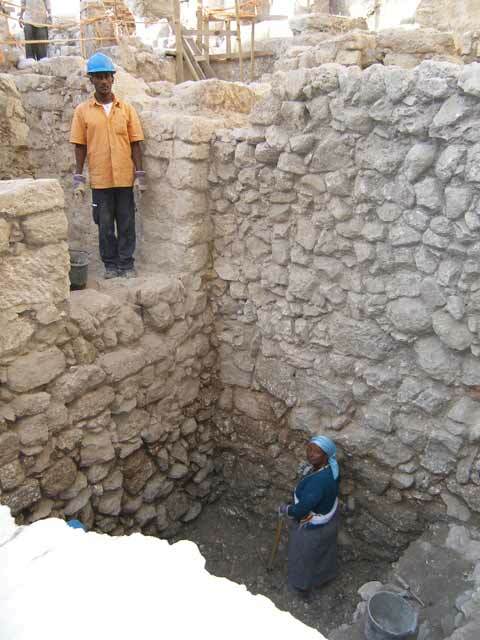 The upper part of a small ritual bath (miqwe), bedrock-hewn and coated with gray hydraulic plaster (L2022; Fig. 3), was exposed c. 15 m north of the aqueduct. Six rock-cut steps were preserved (width over 0.8 m, average height c. 0.35 m, depth of bottom step c. 0.5 m), one of which had a built repair. The bottom parts of two other hewn plastered installations – a bell-shaped cistern (L6170; Fig. 3) and a square installation (L5333; Fig. 3) – were discovered east and north of the miqwe, on a lower bedrock terrace. 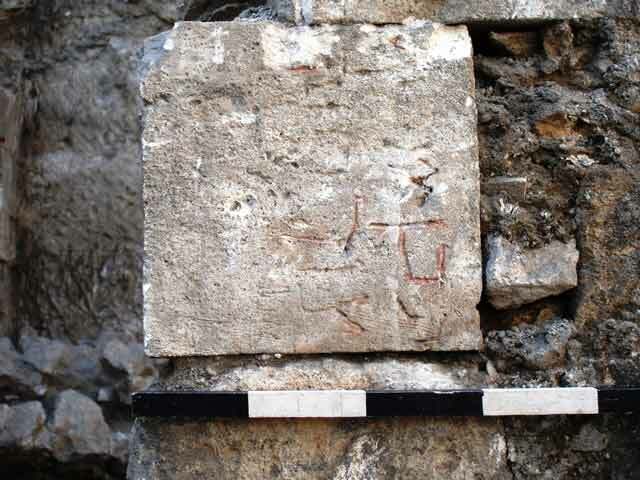 Gray hydraulic plaster, characteristic of installations and ritual baths that dated to the Second Temple period, was discovered on the sides of the square installation. 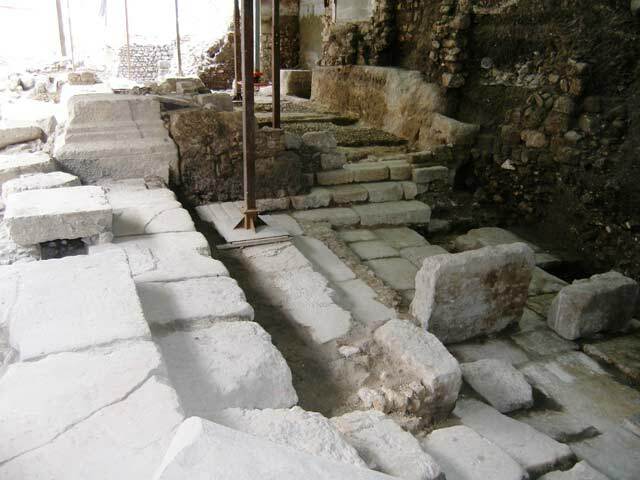 It seems that these installations had originally been integrated in the ground floor of structures from the Second Temple period built on the lower part of the Upper City, which were damaged when the Eastern Cardo was paved. Remains of a quarry (L8170; Fig. 3) were discovered on the low bedrock terrace in the northeastern part of the excavation area (elevation c. 722.5 m above sea level). The soil and stone fill that blocked the quarry contained fragments of pottery vessels from the Second Temple and the Roman periods, after the year 70 CE. Thus, it seems that the quarry should be dated to the Second Temple period, although this cannot be determined with certainty. A broad retaining wall, oriented north–south (W804; length c. 20 m, width 2.9 m, max. preserved height 3.5 m; Fig. 7) was ascribed to this phase. It followed the course of the northern built part of the Roman cardo’s eastern stylobate. The wall’s appearance was rather crude and heavy. Large broken architectural elements, such as a stone threshold, were incorporated in secondary use in the wall, whose foundation was set on the quarries from the Second Temple period and its foundation trench had cut through the soil fill that accumulated and blocked the quarries prior to its construction. The accumulated soil and ash fill on both sides of the wall, particularly on its eastern side that was completely excavated, yielded a rich and diverse assemblage of pottery vessels, including numerous vessels that were similar to those discovered in the pottery workshop of the Tenth Legion at Binyane Ha-’Umma (ESI 13:64–68), locally manufactured vessels, imported lamps and fine tableware. Other finds included fragments of clay masks, military bread stamps that bear names (Fig. 8; Di Segni L. and Weksler-Bdolah S. [in press]. Three Military Bread Stamps from the Western Wall Plaza Excavations, Jerusalem. ‘Atiqot), rare glass vessels and coins. The finds were dated to the time period between the years 70 and 130 CE, that is, after the destruction of the city and prior to the founding of Aelia Capitolina. The abundance of artifacts can be attributed to the Roman Tenth Legion that was garrisoned in Jerusalem at the time. It should be mentioned that none of the recovered finds bore a stamped impression of the Tenth Legion. It could not be determined whether W804 was built as a retaining wall to support the fill on which the colonnaded street was founded, or if it was constructed for some other purpose before the paving of the cardo and was used as a foundation for the street’s eastern stylobate at a later time. The remains of the eastern colonnaded street (cardo) whose entire width was exposed, including the sidewalks and shops alongside it (Figs. 7, 9), were ascribed to this phase. The street remains were exposed to a length of c. 45 m, at a depth of c. 4.5 m below the current level of the Western Wall plaza. The exposed section of the street was paved in a straight, north-northwest–south-southeast direction, sloping gently along a course parallel to the Western Wall of the Herodian Temple Mount. Its average elevations in the north and south were 726.6 m and 726.1 m above sea level respectively. It was 11 m wide between the two rows of columns that apparently stood alongside it (Fig. 7: A). On either side of the street was a sidewalk (width c. 6.0–6.5 m; Fig. 7: B, D) and beyond the western sidewalk was a row of shops, hewn in the bedrock cliff (Fig. 7: C). The overall width of the street and the sidewalks, including the stylobate walls, reached c. 23.5 m (Weksler-Bdolah S., Onn A., Ouahnouna B., Avissar M., 2008. 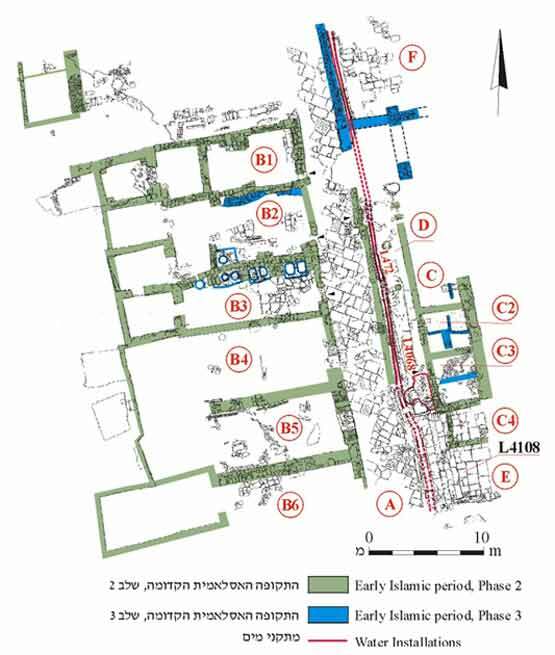 The Eastern Cardo of Roman Jerusalem and its Later Reincarnations in Light of the Western Wall Plaza Excavations. In Y. Patrich and D. Amit [eds.]. 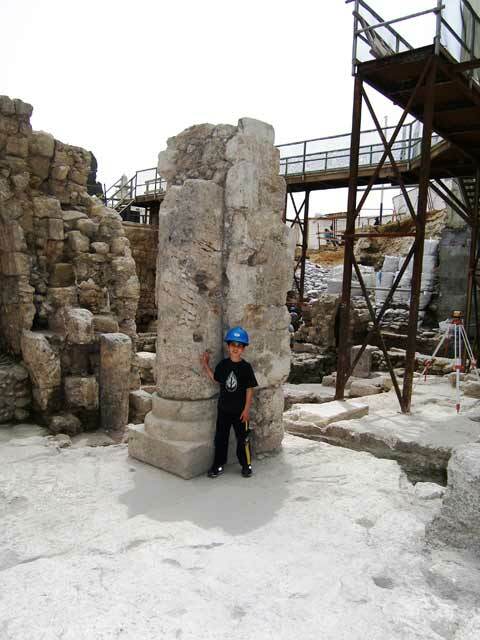 New Studies in the Archaeology of Jerusalem and Its Region, Collected Papers. Vol. 1. Pp. 75–84). Other sections of this street had been discovered in the past along El-Wad Street, north and south of the currently excavated segment (See Fig. 1; Wilson R.E. and Warren R.E. 1871. The Recovery of Jerusalem. London: 281–284; Warren C. and Conder C.R. 1884. The Survey of Western Palestine III: Jerusalem, London: 236; Johns C.N. 1932. Jerusalem: Ancient Street Levels in the Tyropoeon Valley within the Walls. QDAP 1:97–100; Johns C.N. 1948. Discoveries in Palestine since 1939–1948. PEQ 80: 81–101; Hamilton R.W. 1932. Street Levels in the Tyropoeon Valley. QDAP 1:105–110; Hamilton R.W. 1933. Street Levels in the Tyropoeon Valley II. QDAP 2:34–40; Barbe H. H. and De’adle T. 2006. Jerusalem - Ohel Yizhaq. In E. Baruch, Z. Greenhut and A. Faust [eds.] New Studies on Jerusalem 11:19–29; Jerusalem, Ohel Yizhaq, HA-ESI 119, as well as the following Hebrew articles: Hess O. and Eisenberg E. 1977. Jerusalem–Ha-Gāy Street. HA 63-64:48; Ben-Dov M. 1982. 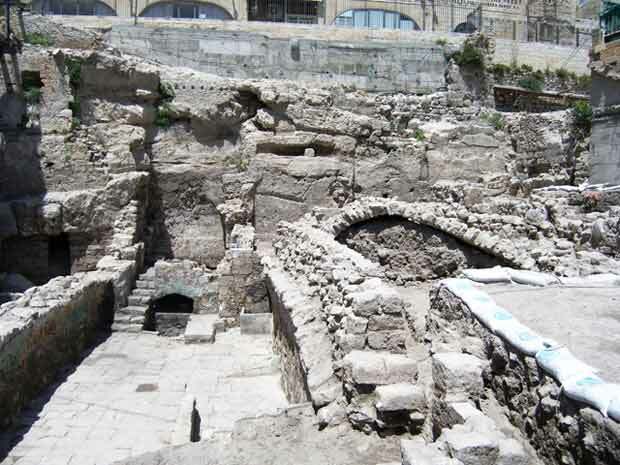 The Temple Mount Excavations in the Shadow of the Walls and in the Light of the Discoveries. Jerusalem. Pp. 227–233; Bar, D. 2001. Aelia Capitolina's Main Street Layout: The Main Cardo versus the Secondary Cardo. In A. Faust and E. Baruch [eds. ]: New Studies on Jerusalem 7:159–168; Baruch Y. and Reich R. 2003. With Regard to the Eastern Cardo in Roman-Byzantine Jerusalem. In E. Baruch, U. Leibner and A. Faust [eds. 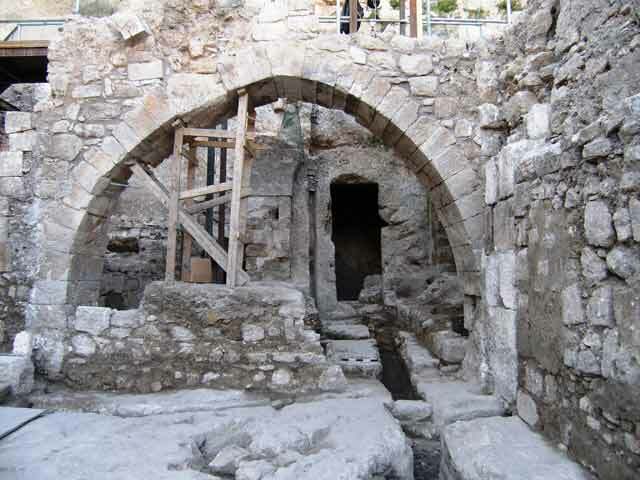 ]: New Studies on Jerusalem 9:147–160; Kloner A. and Bar-Natan R. 2007. The Eastern Cardo of Aelia Capitolina. Eretz Israel 28 (Teddy Kollek Volume):193–205; Gutfeld O. 2007. The Planning of Byzantine-Period Jerusalem’s Streets. Eretz Israel 28 [Teddy Kollek Volume]:66–73). The street (Fig. 7: A) was paved with large flagstones of pale red hard limestone, which were laid in a meticulous manner and placed diagonally relative to the axis of the street. The paving stones’ surface was usually smooth and without grooves. One or two steps were built along the street to bridge the difference in elevations between the street and the sidewalks. The steps were composed of flagstones, similar to those of the street, yet placed along a north–south axis, parallel to the direction of the street. A sophisticated drainage system (Fig. 7: Channels a–h), consisting of a deep channel in the middle of the street and other channels that drained into it, was installed below the flagstones of the street and the western sidewalk. The main drainage channel (b) continued to be used until the twentieth century CE. The latest find discovered below the cardo’s paving stones was a coin that is dated to the reign of Hadrian (117–135 CE). The fill wherein the coin was found was not sealed by a paving stone that had been previously robbed and therefore, it is not a reliable find for dating the street. However, the fragments of the latest pottery vessels found beneath the paving stones were consistent with this date. The finds in general make it possible, therefore, to determine that the road was paved in the second century CE, at the latest during the reign of Hadrian. A single column of those that adorned the street had remained in situ in the western colonnade. This monolithic column rose to c. 2 m high above its base and was discovered engaged within a later pillar that was built around it (Fig. 10). Similar bases, fragments of other columns and also two Corinthian capitals that had apparently decorated the columns along the road, were incorporated in secondary use in the walls of the Early Islamic structure that was built above the street (below). Hewn cisterns, in use until the twentieth century CE, were discovered below the level of the western sidewalk (Fig. 7: B). Cistern 300 was square; its sides were bedrock-hewn as vertical walls and its ceiling consisted of stone slabs that were set on stone arches built in dry construction (Fig. 11). Cistern 712, located to its south, was roofed with some thin flagstones that were laid above the vaulted ceiling. The outline of eight shops, seven of which were of similar size (interior dimensions c. 3.5 × 4.5 m; Fig. 7:4–10) were discerned in the row of shops hewn at the foot of the cliff (Fig. 7: C), west of the western stoa. Three of the shops (8–10) were joined to form a single space in a later period and the reconstruction of their original size was based on the imprints left in the hewn bedrock. The bedrock walls that separated the shops were preserved to c. 3.5 m high. The southern shop (Fig. 7:11) was longer and wider than the others and its bedrock ceiling was preserved. The original rectangular-shaped entrances and their straight doorjambs were partly preserved in two of the shops (Fig. 7:4, 7). The negative of a stone lintel that had not survived and a relieving arch, which was built above it, was preserved above one of the shops’ entrances (Fig. 7:7). Some of the shops were connected by square openings, hewn in their common walls, which were probably added in later periods. An ancient cistern (L6170) in the northern part of the shop’s row (Fig. 7:3) was furnished with a new ceiling of thick limestone slabs that were placed on two arches and were similar to Cistern 300 in the western stoa. Another row of rock-hewn similar cells (Fig. 7:1, 2) was partly exposed west of the row of shops at a higher level. The terraced cells reflect the natural topography on the northeastern slope of the Western Hill. The eastern sidewalk (Fig. 7: D) along the southern part of the excavation was delimited by two rock-hewn walls in the east and west (W424, W457); the eastern stylobate in the north part of the excavation was founded on top of the broad wall (W804, above). The eastern sidewalk was also delineated by two narrower streets, perpendicular to the cardo and 28 m apart: a northern street (L8020; Fig. 7: E) and a southern one (L4108; Fig. 7: F), leading east from the cardo towards the Temple Mount. The partly exposed northern street (E) was paved with thick rectangular flagstones, similar to those of the cardo whose level it exceeded by c. 0.2 m. The general width of this street, restored on the basis of the southern street, is not definite. The southern street (F) was paved with large limestone flagstones, some of which were in secondary use. Its level was lower than the cardo and four wide stone steps descended to it. The flagstones in the two streets were set perpendicular to the direction of the roads and parallel to the north–south axis of the cardo, unlike the diagonal setting of the pavement in the cardo itself. Incorporated in the corner of the cardo and the southern street was a large heart-shaped column base (Fig. 12), which appears to be part of a monumental entrance structure, possibly a gatehouse (propylaeum) of a large public building that may have stood to the east of the street. 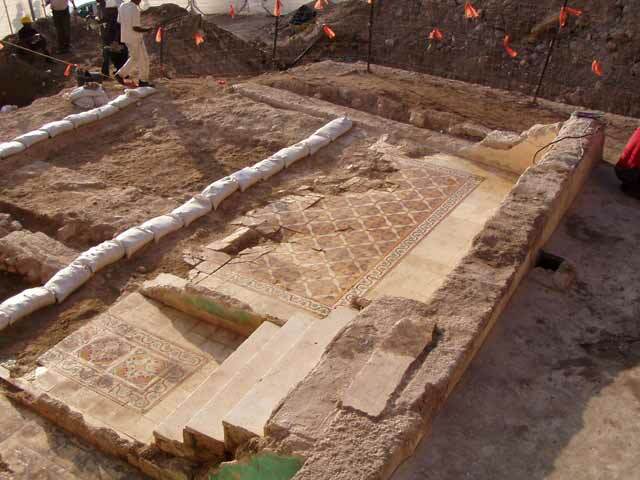 A white mosaic pavement, decorated with rhomboids and flowers, was preserved in the eastern sidewalk and a hoard of coins that dated to the Byzantine period (the time of Emperor Justinian) was discovered in the bedding of the mosaic. The pavement of the sidewalk from the Roman period was not preserved. The exposed remains bear witness to the monumental design of the colonnaded street in the second century CE and to its pavement of large flagstones that were arranged diagonally across the street in this period. Nevertheless, it is not certain whether the entire street with all its components, i.e., columns, sidewalks and the shops alongside it, were completed in only one phase. It is feasible that the completion of the street with its columns, as depicted in the Madaba Map, occurred in a later period. The street’s pavement continued to be used at its original level, yet the width was reduced to just the eastern half (c. 4.7 m; Fig. 13: A). The stone steps, presumed to have been built along the eastern sidewalk, were dismantled and superseded with a tamped-earth floor that abutted the stone pavement at this level. A new wall (W210; Fig. 13) that was built across the southern part of the street blocked it for public use and it became an inner way, part of a large building complex. The width of the street was reduced when a large building (length c. 30 m, width 18 m; Fig. 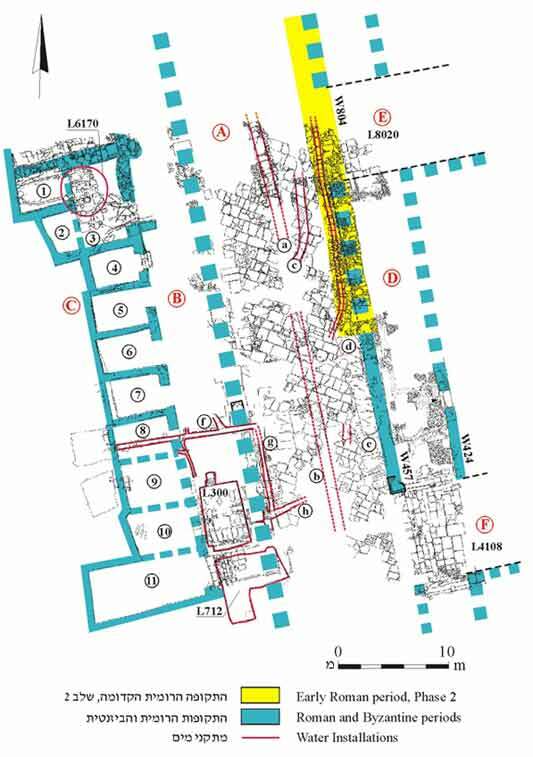 13: B1, B2), whose area included the western half of the Roman cardo, the western sidewalk and the row of shops, was constructed. The eastern wall of this complex was founded on the pavement of the Roman cardo and crossed it lengthwise. The plan of the building consisted of rooms around a central courtyard in the northern part (Fig. 13: B1) and a square courtyard in the southern part (Fig. 13: B2). This building survived in a segmented state below the buildings of later periods. Its walls were built of neat courses of rectangular stones, arranged side by side as stretchers. A tremendous shock caused the courses of the wall to shift horizontally relative to each other and perpendicular to the direction of the walls. This movement was probably caused by an earthquake that struck the region. If so, this evidence may be ascribed to one of the earthquakes that struck Jerusalem in the eighth or beginning of the ninth centuries CE. It should be stressed that the building was not destroyed by the suggested earthquake and in the following periods, its walls were made thicker and strengthened. No changes to the area of the eastern sidewalk (Fig. 13: C) or the roads that faced the eastern cardo were done in this phase. 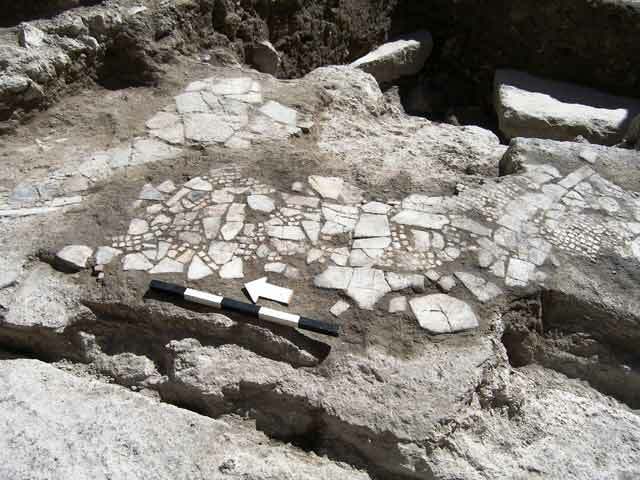 A repair to the plaster of the Byzantine mosaic floor was discerned in the eastern sidewalk. This phase occurred shortly after the previous one. The level of the street (Fig. 14: A) rose by several centimeters, probably due to fill that had accumulated on the stone floors and not intentional rising. Wall 210 was abolished and the street was once again used as a public urban thoroughfare. Its width, however, was reduced to c. 4 m, due to a building that was constructed on its eastern side (Fig. 14: C, D). The structure west of the street (Fig. 14: B) developed in this phase into a complex of elongated halls, each with a separate entrance from the street. Some of the halls (B1, B2) were divided into two rooms. The bedrock-hewn row of shops, incorporated in the western part of the building, was linked to the halls. The building was characterized by walls that survived from the earlier phase and had been made thicker, as well as by the addition of square pillars alongside them that reinforced the walls and supported the ceiling vaults. The function of the building is unclear; it may have been used as a public building, possibly a marketplace. A structure built to the east of the cardo in this phase included a row of small square rooms that were probably shops (Fig. 14: C). It was founded directly above the mosaic floor of the eastern sidewalk and also rested and reused the original eastern wall of the sidewalk. The southern shop of this structure (Fig. 14: C4), was built on the street’s paving stones (Fig. 14: E), which had been made narrower. The floor of the shops was composed of pale yellow marl, mixed with plaster, which was applied to the sidewalk’s mosaic pavement or the flagstones in the street. A narrow corridor was installed west of the the building, extending into the previous eastern section of the street, thus narrowing it. Its plastered floor incorporated within it the eastern rock-hewn stylobate of the street and may have possibly been a sidewalk (width 4 m; Fig. 14: D). A north–south oriented water channel (L472) was installed below the pavement of the corridor in this phase, or slightly afterward. To the west of street 4108, large flagstones were used as covering stones for the water conduit, similar to the stones of the steps in the street. Thus, an upper step was added and the street (L4108) now consisted of five steps. Channel 472 had cut and canceled W210 from the earlier phase. The level of the street was intentionally raised c. 1 m in this phase, although its width and general direction remained unchanged. The raising of the road’s elevation was done with layers of tamped earth, placed one atop the other and sealed with a thick white layer, which apparently served as the street surface, but had only survived by segments (elevation 727.33 m above sea level). It was impossible to determine whether the soil fills above the Street 4108 (Fig. 14: E) indicated that it continued to be used as a narrow dirt road at a higher level or if the fills blocked and negated the road. The northern street(L8020; Fig. 14: F) was canceled when a partly exposed building was constructed. In keeping with the road’s raised level, some of the entrance thresholds of the buildings on either side of the road were raised (e.g., Hall B1, C3), other entrances from the road to some of the halls were canceled (e.g., Hall B3) and the floors inside the buildings were raised. The buildings were also modified. A special pavement, composed of tesserae, pieces of marble slabs and large potsherds, was discovered in Hall B5 to the west of the street, as in Shop C3 to its east. These components probably originated in the remains of ancient buildings and in the heaps of debris that were presumably in the vicinity. Circular plastered installations, which were shallow pools of sorts whose use is unknown, were built in Halls B2, B3 and in Shop C2. A small cistern (L4068) was installed next to the heart-shaped column base and its cross-vaulted ceiling was incorporated in the floor of the corridor (Fig. 14: D). At the end of Phase 8, the building to the east of the street was destroyed. Its remains were sealed beneath a thick layer of soil mixed with marl that was only partly preserved. A broken jug was found in this layer and dozens of faience beads that probably originated in Shop C2 were nearby. A similar layer that contained a collapse of dressed building stones was discovered in Hall B1, west of the street. Based on the pottery vessels and the coins in the destruction layer it seems that the buildings were destroyed, at the very latest, in the ninth century CE. Two severe earthquakes had shaken Jerusalem in the ninth century CE, in the years 808 and 859 CE; the buildings were probably destroyed in the second of these two earthquakes. Soil fills that accumulated to a great height were ascribed to this phase. The fills were dated to the tenth–eleventh centuries CE and in all probability, they reflect a period of neglect during which a thick layer of earth amassed above the Abbasid, Early Islamic buildings. Remains of hearths (ovens) were discovered inside the soil layer and concentrations of broken vessels that are indicative of human activity were found near them. Judging by the nature of the human activity, it seems that during this phase the region was located on the outskirts of the city. The street apparently continued to be used during this period. Large buildings, which continued to be used with slight changes until the twentieth century CE, were constructed on both sides of the street during this phase. The level of the street, which became a dirt road (Fig. 16: A), was raised by c. 0.5–1.0 m compared to the previous period and its width was increased to 4.8 m.
The building on the west side of the street (Fig. 16: B) maintained the outline of the Early Islamic structure, with slight modifications, despite the considerable amount of time between them. It consisted of a large two-story building in its northern part that incorporated the row of rock-hewn shops (Fig. 16: B1–3, B7–10). The walls of this building were usually based on the walls of the Early Islamic structure or on bedrock, and were made extremely thick (up to 2 m wide). Four elongated rooms were located on the ground floor; the two middle ones were relatively narrow (Fig. 16: B2a, B2b) and the outer ones were wider (Fig. 16: B1, B3). The main entrance to the building led to Room B2b in the middle of the structure’s ground floor, which provided access to the side rooms. The floors were only partly preserved. All the rooms were covered with vaults that were partly preserved and bore an upper floor where the principal residential quarters were set. Floor sections of smooth white mosaic or a mosaic inlaid with fragments of marble slabs survived on the upper floor. Clay-pipe gutters were incorporated in the walls of the building, conveying rainwater to the main drainage channel in the middle of the street. Room B9 was extraordinarily well-preserved. 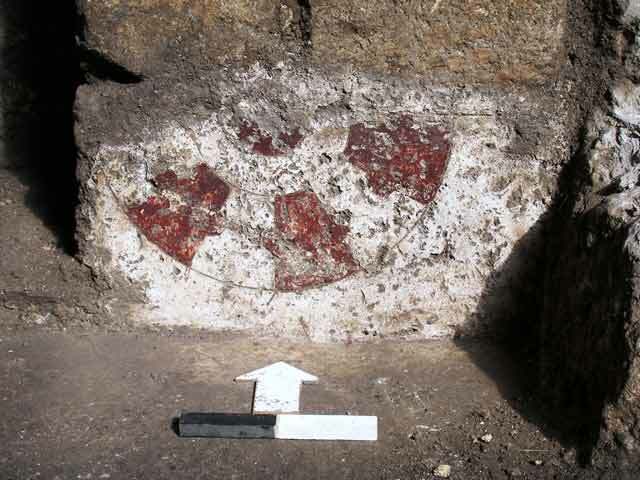 Low bench-like plastered installations were installed along three of its four walls and they, as well as the walls, were decorated with red and white frescoes. The painted patterns were very similar to the red, black and white guilloche stone decoration (ablaq), common to facades of Mamluk public buildings, such as madrasas (Fig. 17). This style of wall painting in Jerusalem was exposed here for the first time. A square inner courtyard surrounded by rooms extended south of the building and the street bordered it on the east (Fig. 16: B4, B5). Wall 70, which separated the building from the courtyard, had three large square engaged pilasters that protruded southward from its line into the courtyard. The wall and the center pilaster sealed within their core a monolithic column, which remained in situ and was part of the cardo’s western stoa (above, Fig. 10). West of this pilasrer was an opening that linked the building with the courtyard to its south. Partly preserved sections of a plaster floor and a mosaic pavement were discerned in the courtyard. A series of crossed-vaults that bore an upper story (Fig. 16: B11, B12) was built west of the courtyard, between it and the bedrock cliff. Seven of the eight square pillars that supported the pointed vaults survived in this building. A small section of a mosaic floor was preserved next to one of the pillars. An elongated hall (Fig. 16: B6), partly exposed south of the inner courtyard, was probably part of another building and remains of a mosaic floor and a small section of an earthen floor were preserved in it. A passage led from this hall westward, to the hewn Hall B13. A large public building was exposed to the east of the street. Only part of it was revealed within the limits of the excavation and it probably extended eastward (Fig. 16: C1–C8). The construction of the building’s western wall (W400) corresponded to the hewn eastern stylobate of the street in the Roman period (above). The most important element in this building was a single cist grave (L4076; Fig. 16: C3), found sealed with stone slabs that were overlain with a built heap of stones, which protruded above surface. The burial cell contained the skeleton of an adult male, oriented east–west in a supine position, whose head was in the west, facing south. The position of the deceased is characteristic of Muslim interments. The skeleton, not accompanied by funerary objects, was transferred for reburial. A plaster floor that abutted the grave’s top was laid at the level of the street. The location of the tomb was preserved, as well as emphasized in later periods when the building continued to develop and its level was raised. The rectangular hall (C3), in whose center the grave was located, may have been opened to the street in this phase. Two entrances led from the street to the halls, situated north and south of Hall C3 (Fig. 16: C2, C4). The street continued to exist as a dirt road, without changes to its character or width. Its level rose slightly and the entrances to the buildings were raised accordingly. Large stone slabs that originated from the pavement of the Roman cardo were incorporated in some of the entrance façades to the halls of the building on the west of the street. The main alterations in this period occurred in the buildings that flanked the street. A bakery, including a round oven for baking bread, was set up in the northern hall of the western building (Fig. 16: B1), which was accessed via an entrance from the street. A staircase that was incorporated in the eastern wall of the hall descended from the street level to the floor of the bakery hall, which was c. 1 m lower. The rooms of the ground floor were paved with partly preserved small square stone tiles. Throughout this phase, a variety of installations were integrated in thin plaster floors that abutted the edges of the stone pavements in the rooms. It seems that the installations and plaster floors were slightly later than the stone floors, although this cannot be determined with certainty. Two elongated halls were built during this phase in the square courtyard south of the main building. The remains of a high barrel-vault roof were preserved in the northern hall (Fig. 16: B4). It was connected by a large arch (W82; Fig. 18) to a room of similar width on its west, inside the cavity of the cross-vaults (B11). 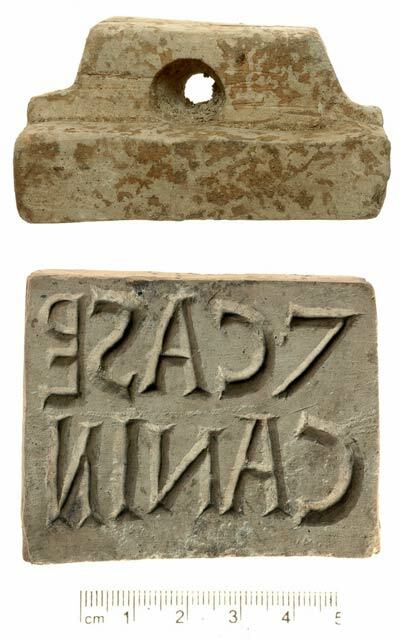 Stones bearing engraved inscriptions in square Jewish script, most likely gravestones (Fig. 19), were incorporated in the walls of the hall, in secondary use. The main entrance to the hall was from the street. Two small square underground rooms were preserved in the corners of the hall on the inside of the main entrance. The northern room (L361; Fig. 16) was preserved in its entirety, including its vaulted ceiling, whereas only the floor had survived of the southern room (L363; Fig. 16). A hall of identical dimensions (Fig. 16: B5), whose entrance was incorporated in the eastern wall, was exposed south of Hall B4. Inside the entrance and below the floor level of Hall B5, a plastered, bedrock-hewn and subterranean installation that was covered with a built barrel vault, was preserved (L518; Fig. 16). A water conduit led to the installation from the northwest. A flagstone floor was partly preserved in the western part of the hall. As no evidence of a vaulted ceiling was found, it is assumed that the hall probably remained open and was used as a courtyard. A barrel vault was built in Room B12, west of Hall B5. 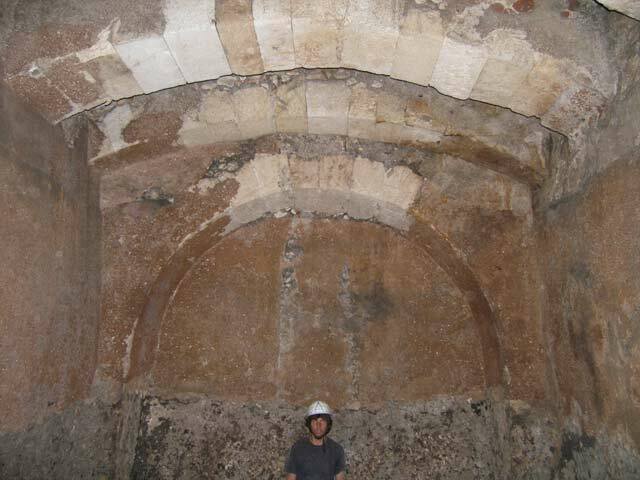 The pillars of the barrel vault supported and thickened the pillars of the cross vault from the previous phase. Hall B6 was paved in this phase with stone tiles that were partly preserved. The building to the east of the street continued to exist with certain changes (Fig. 16: C). Wall 400, which bordered the street, was repaired and made thicker in its southern part; it extended, uninterrupted in this phase, along the eastern side of the road. Hall C2 was paved with square stone tiles. One of the stones was engraved with a game board that consisted of two rows of shallow depressions. Remains of fragmented floor sections were preserved in the other rooms and Hall C3, where the grave is found, was surrounded by walls in this phase. Various installations were installed in this phase within the ground floor of the building to the west of the street. This sometimes resulted in damage to the floors and walls of the building and indicated that the ground floor of the main building was adapted for industrial use. Round plastered installations (inner diam. 0.5–1.0 m, depth c. 1 m) were set in Rooms B11 and B12. Similar installations were built in the structure to the east of the street (Fig. 16: C4, C7) and at the following period, also in the open area north of the building (Fig. 20: B10, below). Due to their shape, resembling the soaking pools used in processing and dying animal skins, it has been suggested that these installations were related to the tanning industry. A large accumulation of crushed chalk (white lime), essential in the process of treating skins, was found on the floor in Room B11. This notwithstanding, it is still difficult to assume that a tanning industry existed inside the city, close to residential buildings or actually inside them. It is impossible at this point to identify the function of these installations, with certainty. It should however be mentioned that similar installations were built in this region during the Early Islamic period (above, Fig. 14: B2, B3). Cisterns and underground installations from the earlier phase (Loci 363, 361, 518 and 3096) were converted in this phase into refuse pits, which were filled with soil that contained numerous fragments of pottery vessels. It seems that the upper stories of the buildings served as living quarters and the ground floors became industrial areas, as well as a location for discarding rubbish. The street level rose by c. 1 m and reached c. 729.9–730.0 m above sea level (Fig. 20: A). A row of small cells (Fig. 20: B1–B7) was built along the western side of the street; some were used as stepped entrance halls for the buildings on that side of the street and some may have been used as shops. The row of cells reduced the width of the street to just 2.5–3.0 m and it is possible that the reduction process had actually begun in the previous phase. 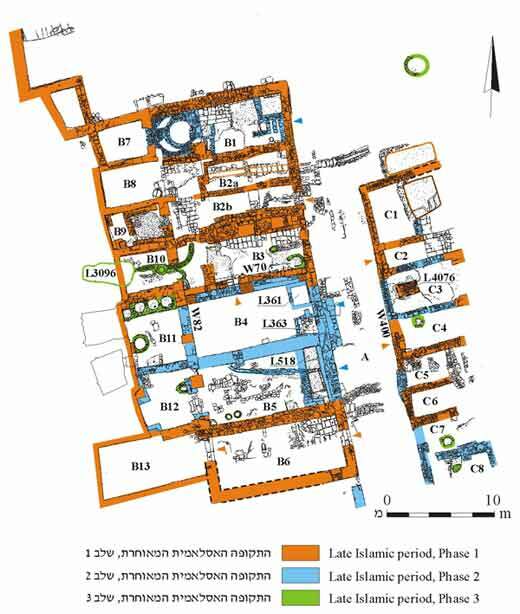 Many rooms on the ground floor of the Late Islamic buildings (Fig. 16: B, C), blocked with soil fill in either this phase or the previous one, were not in use now. The residential quarters in the buildings had apparently been on higher floors that were not preserved. A new hall (Fig. 20: B10) was constructed north of the building on the west side of the street. The entrance threshold to this hall, composed of a flagstone in secondary use that was taken from the Roman cardo, was integrated in its eastern wall. The building’s interior, in which modifications had taken place, was divided by partition walls into three broad rooms. Plaster installations and plaster floors atop pebble beddings were partly preserved in the rooms. The bakery from the previous phase was no longer in use and a plastered water reservoir (Fig. 20: B11 west) was installed above the oven in the western part. Hall B13 was blocked with soil fills to a great height, atop the plaster floors and installations of the previous phase. The western opening that connected the hall with the rock-hewn cell to its west was closed with construction. A tower-like structure whose corners were carefully shaped protruded from the eastern wall of Hall B14. An L-shaped staircase (B5) that led from the street below into the hall was built around this tower. 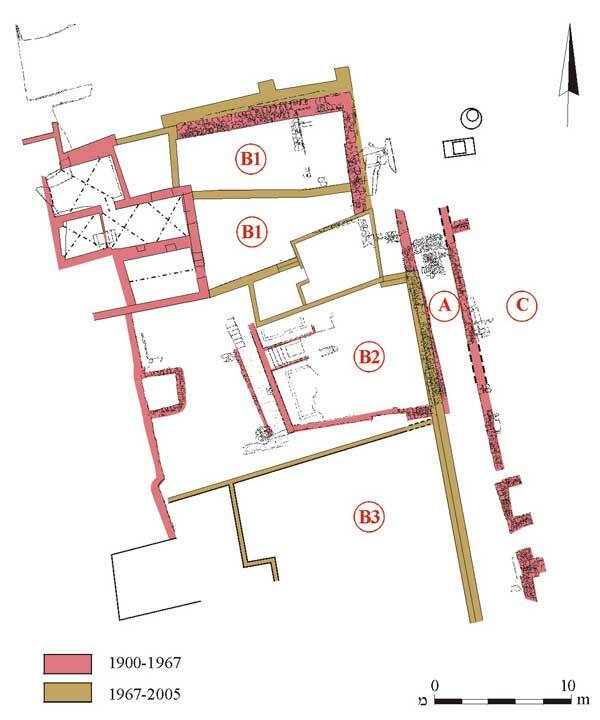 The floor level inside the hall was raised, negating the use of the underground rooms (Loci 361, 363; Fig. 16), which had been blocked with soil in the previous phase. A large heap of soil fill was piled up in Room B25, west of Hall B14, above the plastered installations from the previous phase. This was probably intentional and narrow retaining walls were built to prevent the earth from sliding south. To the south of these walls, a passage that led to a hewn subterranean chamber (L404; Fig. 20) remained open. Another subterranean chamber (L402; Fig. 20) was used as a rubbish pit. These subterranean chambers were probably meant to serve as storerooms; they were hewn at some point after the shops, which had been quarried in the bedrock cliff, although it is difficult to determine when it originally happened. Hall B15 yielded no finds and a small section of a flagstone floor was preserved at the foot of the bedrock cliff in Hall B16. No floors from this phase were preserved in the building to the east of the street (Fig. 20: C). Evidence of severe damage to several buildings, which had occurred shortly after the beginning of the previous phase (No. 14), was discovered. The vaulted roof of Hall B14 collapsed and remained on the floor of the hall, sealed beneath soil fill that had accumulated above it. It was probably during this phase that the large pieces of rock separated from the upper part of the hewn bedrock cliff and fell onto the floor of the room at the bottom of the cliff (Hall B16). The bedrock ceiling of a room (L715), first hewn in the Roman period, had been damaged and cracked by earth tremors. Historical sources mention an earthquake that had struck Jerusalem and the Temple Mount in the year 1540 CE and the collapse was probably a result of this event. During this period, the street maintained the same width (2.5–3.0 m) and its elevation in the twentieth century was 730.35–730.50 m above sea level, that is, c. 4 m above the original Roman level (Fig. 20: A). On the west side of the street, the shop cells and the buildings from the previous phase continued to exist, although hardly any use was made of the buildings’ ground floors. An exception was Hall B12 where four thin plaster floors were discovered one atop the other. Hall B15 was renovated and a bakery was installed inside. A paved alley (B6) led from the street into the hall that was paved with large square flagstones, some of which were flagstones from the Roman cardo in secondary use. A round oven for baking bread was installed west of the hall; it was preserved in its entirety, as was a staircase that led to the upper level above the oven (Fig. 21). Partition walls were built in Hall B16, to the south of the bakery and a new tile pavement was installed. The large structure on the eastern side of the street was renovated in this phase and pavements of square stone tiles (Fig. 20: C1–C3, C7) were preserved in many of the rooms, whereas in the in the entrance hall (C2) was a thick plaster floor. The rooms to the north and east of Hall C2 were paved with stone, in which a staircase that led to an upper story was incorporated. Hall C3, to the south of Hall C2, was paved with flagstones around Tomb 4076 (above), whose location was still preserved. Integrated in the southern wall of Hall C3 was a semicircular niche, paved with stones in secondary use that had been removed from the cardo. The niche was probably used as a mihrab and the hall served for prayer. Square plastered niches were incorporated in the eastern walls of Halls C4 and C5. They were as wide as the halls and c. 0.5 m higher than the floor level in the halls. A cistern (L4005) was possibly installed in this phase. At the end of the nineteenth century or in the twentieth century the street was paved with small stones (Fig. 22: A); it was c. 2.5–3.0 m wide and its elevation was c. 730.5 m above sea level. A ceramic drainage pipe was discovered in the middle of the street, beneath its pavement. A new structure (Fig. 22: B2) that only partially survived was built above the ruins of Hall B14 on the western side of the street, in the first half of the twentieth century. The walls of this house were built of concrete and the rooms were paved with decorated tiles (Fig. 23). The Mughrabi neighborhood was demolished in 1967 to create the Western Wall plaza (Fig. 24). The current plaza (Fig. 22: C) is paved with flagstones and slopes gently from west to east. The elevation of the plaza’s western side (c. 731.1 m above sea level) is c. 0.5 m higher than that of El-Wad Street (Fig. 22: A), as it was until 1967. The plaza is delimited on its western side by a low stone wall, whose top has steps in two levels and is used as a bench. West of the Western Wall plaza—between it and the bedrock cliff that separates it from the Jewish Quarter—a two-story building remained standing (Fig. 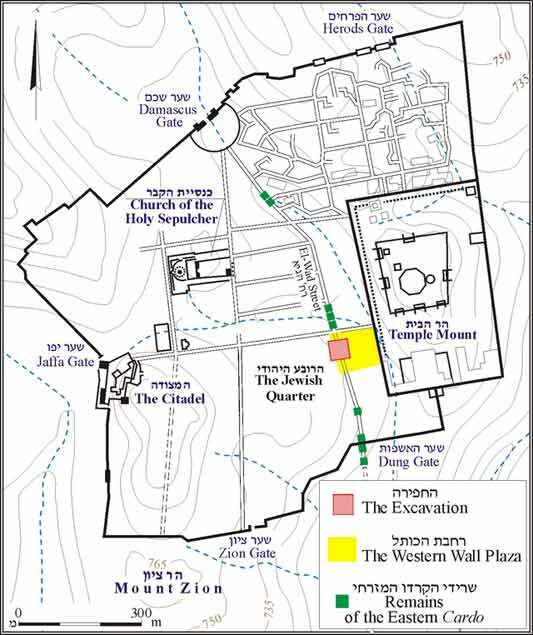 22: B1), parts of which were used by the Israel Police and the Western Wall Heritage Foundation. The upper stories of this structure, which were built above the earlier parts from the Early and Late Islamic periods (above), were dismantled within the development activities at the site. South of Building B1 and B2 remained an open area, where a paved plaza with a drinking fountain was created (Fig. 22: B3). This area, at the foot of the bedrock cliff, was no longer visible because of debris that covered it, resulting from the renewed construction of the Jewish Quarter. 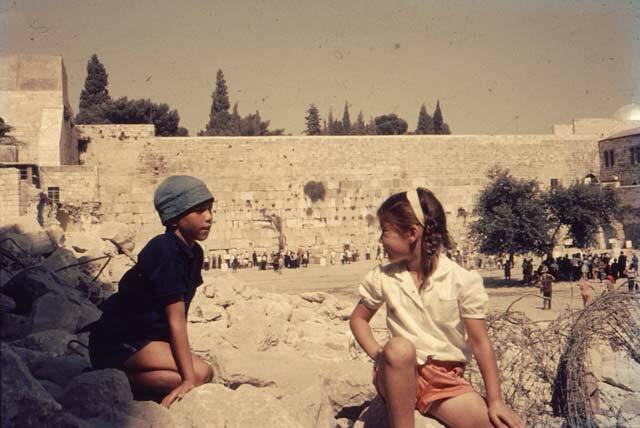 Prior to the excavation, it resembled an artificial slope that had slid down from the Jewish Quarter to the Western Wall plaza. 3. 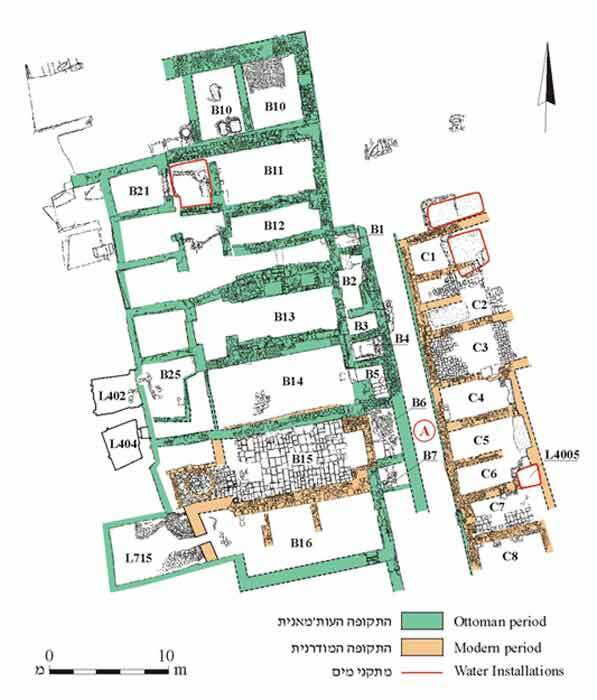 The Iron Age and the Early Roman period: First and Second Temple periods, plan. 4. Iron Age building, looking east. 5. Floors and walls of the Iron Age building, looking west. 6. A personal seal bearing a decoration. 7. 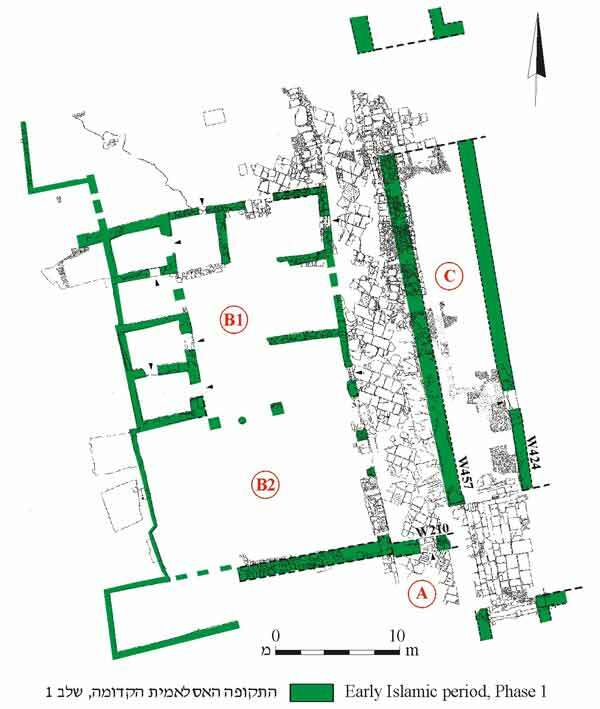 The eastern colonnaded street (Cardo) in the Roman and Byzantine periods, plan. 8. A military bread stamp. 9. The cardo, looking southwest. 10. A monolithic column in the cardo, engaged in a later pilaster, looking southeast. 11. The arched cistern (L300) in the western stoa, looking south. 12. Heart-shaped column base in corner of cardo and southern street (L4108), looking north. 13. The Early Islamic period, Phase 1, plan. 14. The Early Islamic period, Phases 2, 3, plan. 15. A pavement of tesserae and marble fragments in secondary use, looking east. 16. The Late Islamic period, plan. 17. Frescoes in the Late Islamic building, looking north. 18. Arch 82 from the Late Islamic period, looking west. 19. A gravestone (?) in secondary use engraved with Hebrew script. 20. The Ottoman period, plan. 21. A bakery in Hall B15, looking west. 22. The twentieth century, plan. 23. Decorated floors in a modern building, looking southeast. 24. The excavation site at September 1967. The Western Wall Plaza following the destruction of the Mughrabi neighborhood, looking east. Photo: Amnon Weksler.